Our day passage east from Key West to Marathon Key started off beautifully enough, as the photo above shows. Impossibly azure seas and gentle breezes propelled us happily east. What else can you do, right? Immediately we heard the national weather service warning for water spouts and severe weather blaring on the radio on channel 16, complete with sirens and scary WHOOP! WHOOP! WHOOP! sounds. Alrighty, then... Welcome to Florida, which is, I believe, the tornado/water spout capital of the world. About 2 hours later, with a sigh of relief we entered the Marathon Key harbor and scored a mooring. The next day dawned a bit clearer, with more settled weather. There are hundreds of boats moored and anchored here. Many live here year round. The cruiser's lounge here sports the biggest and best book exchange I've seen during our entire trip! "I wouldn't swim in there if I were you. There are bull sharks in this harbor." As this National Geographic photo shows, Bull sharks are the slightly smaller cousin of the Great White. And as their name implies, they are not to be messed with. I finished my swim and casually (yet briskly) climbed up the swim step and exited the water. We thanked our new neighbor, whose name is Larry, He's on the trawler Sea Horse. Larry, it turns out, is a pretty good banjo player. We wasted no time and set up a small jam aboard Espiritu that night. We actually played Dueling Banjos from Deliverance. Here in the south. We set about exploring Marathon Key. 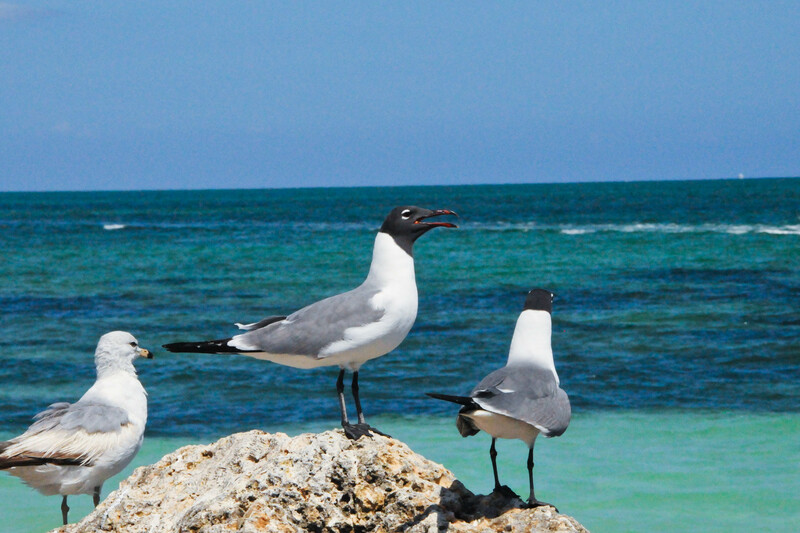 The first thing you notice is the amazing black-headed seagulls which rule the island. We were out of fresh fruits and veggies, so Scruffy's Produce helped us out. We saw this sign in a thrift-store window. "All Books $1.00, except Bibles and Physician's Desk Reference (PDR)." Well. I guess we really are in the south now. I can understand the Bibles, but PDR's? Maybe there are lots of folks wanting to look up Oxycontin and amphetamines, I guess? OK, I'm sorry. Here's a real fashion DON'T. I guess our hapless first mate here gets extra credit points for the fact that her gigantic visor actually matches the magenta top, but Lordy. :-/ Fashion gone wrong, IMHO. Captain Chris got another mechanical disappointment when our outboard died on day 2 here in Marathon. He and Larry worked on it for hours, but to no avail. Being very far out in the harbor, we now had no transportation, and were reliant on the kindness of strangers to help us get around until we could repair the outboard. Meet another new friend, Lance the salty sea dog. He helped us out and was there for us when we needed him. He's the real deal -- a true Florida man of the sea. The next evening Larry arranged for another jam, this time aboard his roomy trawler Sea Horse. He invited his friend Brian, a very talented local guitar player. We had a fantastic jam in Larry's "living room" aboard his trawler. Space on a boat -- what a concept! Yep. Iguanas swim. 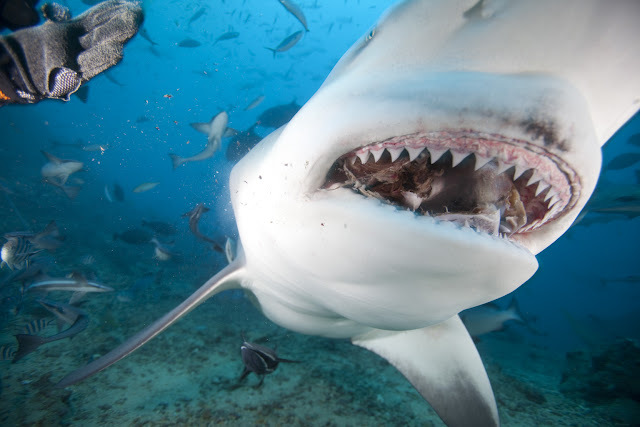 I can't help but wonder if they're a tasty meal for the Bull Sharks? Well. As if we needed another reminder that we are back in the U.S. of A. We rarely if ever saw an American car during our 17 months in Central America. And we literally NEVER saw a muscle car, monster truck or Escalade-type giant SUV. I think we Americans are pretty much the only ones who drive these things anymore. We loved this cute little barber shop, but sadly, it was closed. OK, check this out. I placed my water bottle next to this flying crustacean for perspective. I've gotta hand it to Florida -- after all those months in Central America, who would have thought that my "biggest and most disgusting bug" award would go to the state of Florida. Well done! I guess our adventure is not quite over yet, eh? I loved this. This is an actual front yard (see the yellow home to the left behind the trees). I think life is pretty good here in Marathon Key. We took the outboard to a local mechanic to be repaired. We had a mini-drama here in Marathon, which made the local papers. Law enforcement boarded a rather derelect sailboat here in the harbor with great fanfare and took away the skipper in handcuffs. Turns out the perpetrator had an illegal weapons stash and had threatened to assassinate President Obama. Yikes. We celebrated the repaired outboard by grabbing a meal in a cute little waterfront seafood place. Look who came ambling right through the middle of the restaurant looking for scraps? From this angle, he looks a bit like Big Bird, doesn't he? Gigantic sand dollars (courtesy of Home Depot, according to the locals)! A sign on a locals property warns: "Beward of Attack Iguana." After our two rousing jams here in Marathon, we couldn't believe our luck when the guitarist Brian invited Chris, Larry and I to a jam at his waterfront home with his friend, Len, another guitarist! Before we knew it, we were in Brian's cozy living room having a whole lot of musical fun. Music. How fortunate are we? New friends and another amazing evening of fun and laughter here in the Florida Keys. We'll always remember this place. Well, the plan is to make the one night sail northeast to Miami tomorrow morning. I'll check in online when I get a chance, so give us a few days. Great to see you back safely and darn - we would have loved to be at that jam session! Right now in St. Simon GA and off to Savannah overnight. I had a great time jamming with you guys. Really glad you could make it. Fair winds. It has been educational following your travels, as we are about to leave on a similar path this fall. What's next for you two? Stateside for good? Or just a brief stay?